The B&M Spring Pin Insertion Tool is the ideal tool for low to medium volume assembly applications as a manual tool. For higher volumes our pneumatic variant provides high quality - high speed insertions. The tool provides a quick, reliable, and consistent insertion process. This saves you time, money, and frustration over alternative insertion methods like needle nose pliers, tissue paper, or hair combs. What Pintool should I buy? Let's say the size of the hole in your application is 1/16”. When you look through your MSC or McMaster-Carr catalog buy a pin based off the nominal size of your 1/16" hole. Having said this, understand that the actual (relaxed) diameter of your spring pin will be larger than its nominal size. If you measure your 1/16 (0.0625)" spring pin, you will find they measure ~.066. This is because the pin is designed to be larger than your 1/16” hole; contracting as you press it in and expanding to create a snug fit once inserted. For additional information, take a look at this Wikipedia article or our own Spring Pin Reference Chart. Exact dimensions may vary if you purchase a specialized, heavy-duty, or light-duty spring pin. Check with your seller or manufacturer to find information on the pin's relaxed outer diameter. All of our standard and metric sizes are available on our product page. 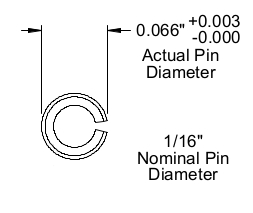 Note the Pintool part numbers correspond to the nominal spring pin sizes. In other words, if you have a 1/16" hole and a 1/16 spring pin you should buy a 1/16 Pintool (PT-062). If you still have questions take a look at our Spring Pin Reference Chart. This chart will list nominal spring pin dimensions as well as the appropriate sized Pintool for the part. Can I use a stainless steel pin? You can but you will not have the benefit of the magnetic guide. Will the pintool fit in my space that is x" wide? Take a look at our blueprint. This will let you know if the tool fits into your tight space or if your chuck is large enough to accommodate the Pintool handle. Does the Pintool remove pins? Yes, but in a limited capacity. The punch does extend somewhat past the end of the guide so the tool can assist in pushing a pin out of a thru-hole. Do you have any alternatives for high volume applications? Yes. The Pintool is designed for heavy duty applications. Feel free to use a hammer to assist with insertions. In addition, the back is designed to be machined to fit into an arbor press or chuck. If you have a special application we can modify the tools as a part of a custom order. If you're working with large quantities or need to do rapid insertion, this tool can be adapted to utilize pneumatic equipment. If this is something you're interested in please visit our contact page. The items listed on our product page are the products we keep in stock. Typically, we do not accept custom orders for Pintools. However, B&M Machine is a full service machine shop that can handle a variety of machining and additive services. If you are interested in obtaining a quote, let us know on our contact page. We want to know what you have to say. If you still have questions about the product or have any issues or improvements you'd like to let us know about, get in touch with us on our contact page. Are you a return customer? Share your experience with us and other customers by leaving a review on below.